Preheat oven to 425°F. Lightly oil large rimmed baking sheet. Place coconut in wide shallow bowl or pie plate. In fairly large bowl, whisk together melted butter, oil, salt and cayenne pepper. Toss shrimp in butter mixture, ensuring that each shrimp is lightly coated with butter. Working with one shrimp at a time, press each into coconut, pressing gently and shaking off excess. Place in single layer on prepared baking sheet. Bake shrimp until coating is golden brown and shrimp are opaque throughout when pierced with tip of knife, 10-15 minutes. While shrimp is baking, make slaw. Mix sour cream, mayonnaise, lime juice, fish sauce, curry paste and brown sugar until well combined. Season to taste with salt and pepper. Toss dressing with cabbage and carrots until well coated. Add cilantro to taste. 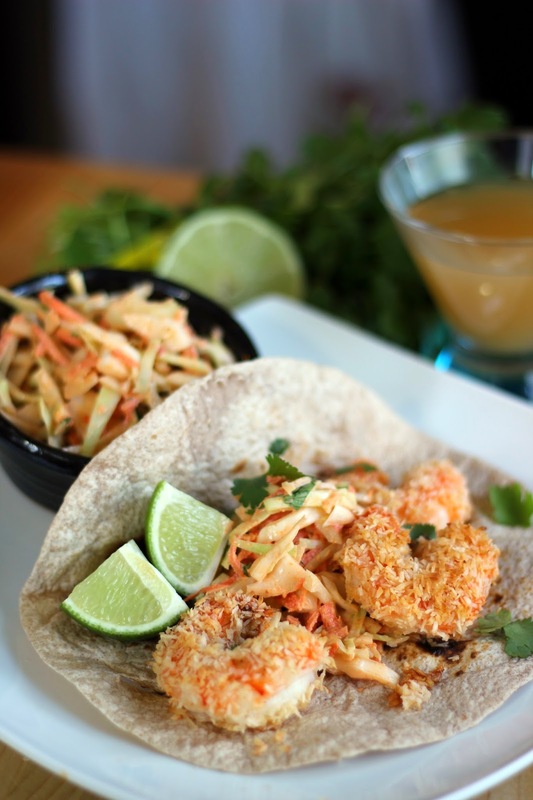 To make tacos, place spoonful of slaw in each tortilla, top with 2-3 shrimp and squeeze of fresh lime juice.